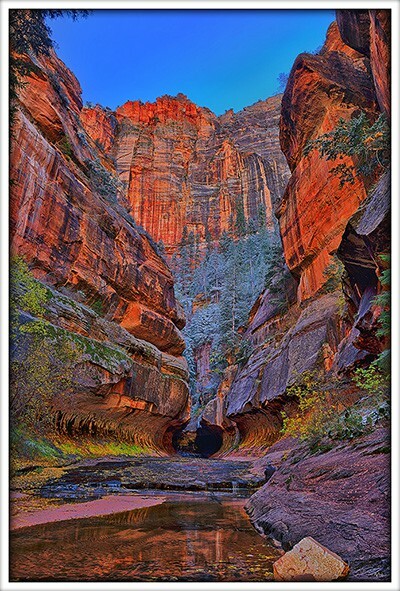 In much of Zion, 'limited access' means having to deal with the shuttle system providing transportation to specific locations in the main canyon. For those willing to venture off into the wilderness, however, there's the Left Fork of North Creek, and a spot referred to simply as "The Subway". A wilderness permit is required for entry into the Left Fork region. During the summer months, permits are awarded via a lottery. In late fall and winter, the lottery is not used and permit reservations are easier to secure. There are two approaches. The first, 'from the top', requires rappelling and mountaineering gear. The second, 'from the bottom' only requires a willingness to get wet and stay that way for the day. I recently enjoyed a cold, wet hike to the Subway following this approach. Once in the canyon, I began hiking up the Left Fork, ignoring the common wisdom that trying to stay out of the water was a waste of time. I wore neoprene socks and pants, but with temperatures in the forties, I hoped to stay dry. It wasn't long when I slipped on a boulder and got thoroughly dunked. My first lesson was the basalt boulders were much more slippery than the red sandstone boulders. From then on, I avoided water when sandstone was available, but walked in the water when nothing but slick black rocks were present. Occasionally there were trails on one side of the creek or the other that would keep me out of the water for tens of yards. Those were awesome stretches. After a couple of hours, the canyon narrowed considerably and the route became wetter and more difficult. Then, alas, the entrance to the Subway was visible. Time passes quickly in the Subway. It is so beautiful it's hard to stop taking pictures. There were five other people there while I was present, and none of them seemed ready to leave either. But I packed up to go, remembering the remnants of an unauthorized campfire I spotted in the canyon, where someone perhaps got stuck for the night. As soon as I began working my way downstream through the canyon, the others followed and we all hurriedly tried to exit before darkness fell. Along the way, two of the people told me they had done the same hike just a few days earlier and had to climb out of the canyon in the dark. Although they began their hike today earlier, the higher water from the recent snow made the hike take considerably longer.